If the mind is like a kite, the breath is like a string. Sri Sudhir Tiwari is the eldest son of the beloved and highly respected teacher Sri O.P. Tiwari. Sudhir was brought up at Kaivalyadham Yoga Institute, in Lonavala, India, amidst rich traditional yogic heritage of Swami Madhavdasji Maharaj, Swami Kuvalyanandaji and Swami Digambarji. 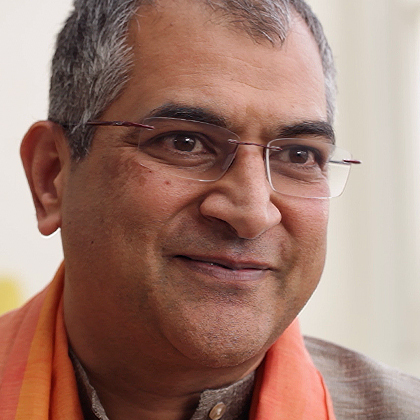 Sri Sudhir Tiwari shares his advice about how our attitude is an important part of our practice. If we want to grow in our yoga practice, often we are told to simply "keep practicing”. But it's not just about getting our bodies onto the mat or cushion on a regular basis. Ujjayi Breath is by far one of the most popular pranayamas. Sri Sudhir Tiwari explains the technique and benefits as described in the Hatha Yoga Pradipika, a classic and influential sanskrit text on hatha yoga. Deepen your understanding of this simple but powerful breathing technique, often applied in vinyasa and ashtanga yoga. A talk about the definition of Pranayama and its multiple meanings. About why one should practice Pranayama and how you can control the mind with the breath correctly, so it can eventually change your life. Swami Digambarji initiated Sudhir in 1981 and accepted him as a disciple. Sudhir received his primary and advanced yogic and ayurvedic training from Swami Digambarji which included the study of traditional texts, mantra yoga, fire ceremony, pranayama and various aspects of adhyatm (spiritual) yoga. Sudhir also learned pranayama and hathapradipika from his father. Since early 2012, at his father’s request, Sudhir has traveled around the world conducting workshops in the theory and practice of yoga (asana, pranayama, meditation, chanting) and ayurveda, and spreading humbly the fundamentals of undiluted yoga. Sudhir now lives in Toronto, Canada, with his wife and two children. When you meet Sudhir, you will know he has lived and breathed yoga his whole life. He is a rare example of a humble, yet energetic and enthusiastic teacher with a mastery and knowledge of yoga you won´t encounter very often. In his videos you will explore the yoga and ayurveda tradition but also the scientific reasoning behind why we do the yogic practices.